I have been neglecting this blog, and while I have a million and one reasons, today’s random photo of the day is my most adorable excuse. Meet Aurora Louise, our (almost) five month old baby girl. Although it’s in no way an award winning photo, I love it for so many reasons… but mostly because it’s a fleeting moment, a trivial moment, to be sure, but it’s a memory. And years from now she’ll be able to see not only how she looked as a baby, but also a small bit of her world on that ordinary Saturday morning, including her daddy’s painting of the full moon (which she loves to stare at), and Duncan’s Totoro plush (which she has adopted), the bunting I made from heirloom linens for our wedding and to hang over her crib, and of course Daddy’s comic book pillow. I expected to get more use out of my camera than ever before once Aurora came along. I supppose I had hoped to capture every moment. Every smile, every milestone, every. waking. moment. 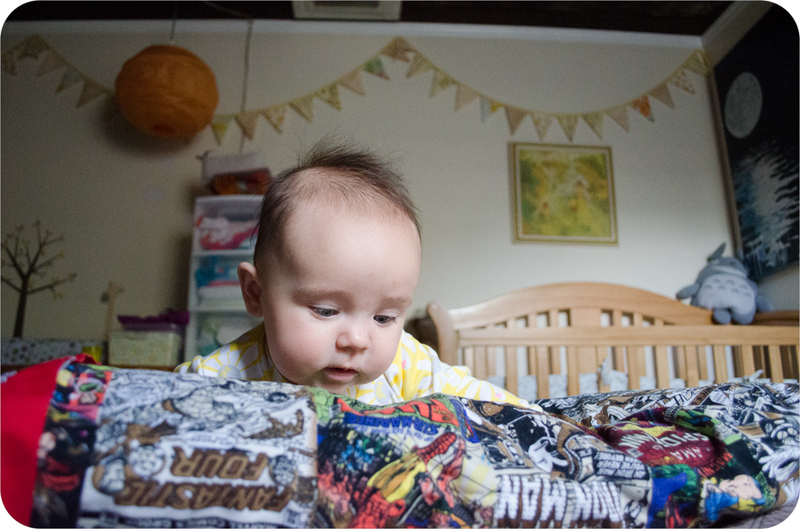 And now, five months since her arrival, I sometimes find myself feeling guilty for not documenting more during her fleeting first days. Now, don’t get me wrong, I’ve got plenty of cell phone shots (since my phone is, of course, never too far from reach). But my plans of perfectly framed (and frame-able) works of art with natural soft light, and bokeh out the wazoo went right out the window with oh so many sleepless nights and more poopy diapers than I can count. Photography is just one of many things that seem to be slipping (along with my mind… hello! mommy brain, anyone?) But I’m learning to cut myself some slack. I find now more than ever that I’m so wrapped up in the moment that I forget to document everything. Which I suppose is a good thing, right? Besides, I know that this isn’t the last time as a mommy that I’ll feel guilty, or worry that I’m not doing enough. I also wanted to write letters to Aurora, to give her one day when she was old enough to appreciate them. I wanted to write one before she arrived, on the day of her birth, on each birthday, and when musings or inspiration struck in between. I think I read about the idea somewhere years ago and decided that I most certainly wanted to do that for my daughter. And after she arrived I held her in my arms and had a million things I wanted to tell her …*ahem* care to guess how many letters I’ve written so far? Exactly zero. I just couldn’t bring myself to put her down long enough to write those letters, so I told her instead. I hate knowing that she won’t remember what I told her (heck, I can’t even remember what I told her) but I guess I hope that someday when it’s all said and done, she will understand. Or at least get the gist. “Always remember, you are strong, and you are confident, and you are beautiful inside and out. This wide world is full of things for you to see and make and do.